Trevor posted about the guest speakers for the next ResellingDO and motivated me to post about my efforts of scaling up before the DO. I haven’t spoken to any of the guest speakers or what they did to get to where they are now on scale. From the sounds of it, what I’ve done is a little bit different than what the awesome guest speakers will discuss. Around this time last year, I reached a point where I outgrew the space I was using. There were too many Target boxes coming in and the working space was not ideal. Renting a UPS box was not an option because the issue of no working space remained. I began looking around for facilities that allowed pick up and drop offs of parcels of various local facilities. In the research phase, I came across self storage facilities as the ideal locations that would accommodate all my needs. Oftentimes, it is a hidden benefit and some times it’s a publicly offered benefit. 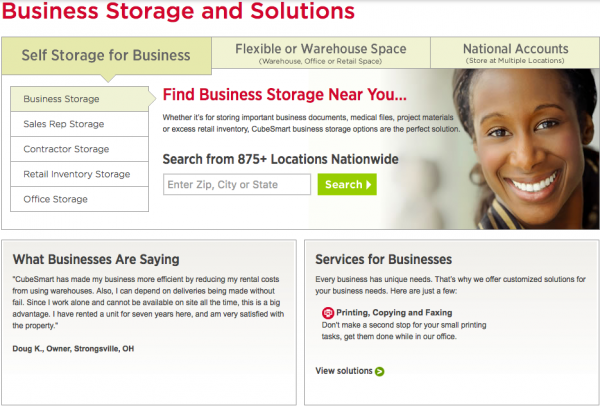 Cubesmart, a nationwide self storage facility, publicly advertises their ability for business solutions with their spaces. One Cubesmart location I contacted only accepted packages and you must pick up that day. It was a bit inconvenient as I do not always go to storage every day. Using the example of Cubesmart is not an endorsement, but just an example of one of many self storage facilities. This one is important because not all facilities allow you to work inside like packing and adding . Some storage units only allow the customer to bring personal belongings for storage only. This one is important because any retail arbitrage, inventory pullbacks from Amazon, or any parcels allows you to be more hands off when it’s inside your unit. Similar to the package drop offs, this one is the most important. One facility I rented a space had two dock height bays, but wouldn’t load pallets into the units because of OSHA rules. That same facility said they would only sign the release for the pallets, but would stay on the dock and they would not be responsible should anything happen to it. I did not like that idea of potentially having a delivery on the dock. Having a dock is important because receiving pallets, the delivery cost will be lower when the truck does not require a lift gate. Unloading a truck from a dock also doesn’t require a fork lift. Having UPS or FedEx come pick up is great, especially after all the products are ready to ship after all the packing. No need to take it home or drop it off to another location. From my own experience with using FedEx, shipments to Amazon arrive faster when you choose the business setting instead of a residential address. Granted, you can also select business in the FedEx screen for the same service. For pallet pick ups, it is the same reasons for having a dock for deliveries, but in the reverse. Some facilities have electrical outlets in the hallways available for the tenant to use. This goes hand in hand with the ability to work inside a facility allowing you to do many of the functions needed to support your Amazon business. This one needs to work for you. One facility that I’ve had space had an office open from 8 AM to 7PM with facility hours from 6 AM to 10 PM at night. The current facility that I am renting from has hours from 8 AM to 6 PM most days. Obviously, you need to choose a place that works for you. This is an important to keep in mind. It would not benefit anyone if the facility does not equipment or not have enough like flat bed carts of a pallet jack. It would be pointless if the storage unit facility has a loading dock, but no pallet jack. I am currently renting 350 square feet, 2 10 feet x 10 feet , and 1 10 feet x 15 feet. The 10×15 is my “office” and one of the 10×10 is my “inbound” only storage unit. The second 10×10 unit is my “outbound” unit where parcels are placed and ready to be shipped. My office contains everything that I need to operate efficiently. I have 2 workbenches, racks, various supplies, and printers. These capabilities allow me to process about 4 pallets of product a month. The facility I use does not have electrical outlets nearby. It is a little inconvenient not having a nearby electrical outlet, but that problem was solved with a Goal Zero Yeti 1000 battery from Costco. I hope this post gives you some ideas on where to expand and how to expand. Without the additional storage, I would not have been able to grow and have the capabilities to accept pallets. Using storage units gives you flexibility to scale up or down with space needs as you are not locked into any kind of lengthy contracts. When looking for a storage facility, my best luck has been through mom and pop small business facilities instead of the more “corporate” ones. Wifi, or failing that, decent 4G LTE reception in the building and a cell phone supporting wireless hotspot operation would be important IMO.